The images and text below are from an e-mail announcement sent to an acquaintance. Notice the bit about Wikipedia in the second to the last blurb. The energy and thought that goes into Zionist propaganda efforts is nothing short of impressive but when you're selling lies, injustice, and bloodshed you have to work pretty hard. Still, Palestinian solidarity activists could learn a thing or two and they can also join Wikipedians for Palestine, but there's no fellowship money. Updates on Campus Events and More! Hasbara Fellowships Summer Program In Israel! Click here to link to our Hasbara Fellowships Facebook Group! On May 7th, 34 students from 14 Canadian universities made their way to Jerusalem to participate in the Hasbara Fellowships program in Israel. The Hasbara Fellows met with influential Israelis such as Jerusalem Post journalists Khaled Abu Toameh and Gil Hoffman, and Palestinian Media Watch founder Itamar Marcus. The students toured the security barrier, the Golan region, Israel's southern borders and more. They learned about Israel's humanitarian aid and visited the Save a Child's Heart house. The participants also enjoyed a spectacular group Shabbat in the Old City of Jerusalem. The Hasbara Fellows are returning to their campuses well prepared for an exciting year of Israel activism! Check out our Hasbara Fellowships Blog. Click here to apply to the August Hasbara Fellowships! Registration is still open for this summer's Hasbara Fellowships Activism Training Program in Israel! Past programs have met with Israeli leaders such as Shimon Peres, Natan Sharansky, Dore Gold and Bibi Netanyahu. You will acquire effective Israel activism training, learn from fellow activists from campuses across North America, meet top Israeli politicians and leaders, and gain specific programming ideas and campaigns to bring back to your campus. Come explore Israeli and Middle Eastern history and politics and sharpen your activism skills! Registration is still open for the August 5th-August 21st program. Top pro-Israel university activists from across North America are invited to APPLY NOW for this summer's programs. Students interested in upcoming programs to Israel should visit www.israelactivism.com for more information, including a past program itinerary and pictures! Yom Ha'atzmaut was the word on the Stanford University campus, as the Stanford Israel Alliance celebrated Israel's 59th birthday. Over 200 students came out to celebrate Israeli music, art, and food, in addition to learning from an array of material from Hasbara Fellowships. UCLA celebrated Israel's 59th Independence Day with a phenomenal festival on Bruin Walk. Over 3,000 students viewed booths offering Israeli food, music, t-shirts, CDs and a souvenir sale. The Israel week culminated with a special 250 person Israeli Shabbat dinner. Kol Hakovad to incoming Hasbara Fellow Shirley Eshag-Hay and to Hasbara Fellow Lauren Winkler for organizing the week-long celebration. At UC Davis, students had a chance to experience Israel 360, the dynamic multi- media presentation about Israel... from A to Z! Over 50 students came out to view the presentation, taught by Senior Campus Coordinator for the West Coast, Elran Tsabag. Israel 360 engages those who knew little about Israel by highlighting exciting components of Israeli history, geography, and culture. Special thanks to Hasbara Fellow Brian Levine, who helped promote the event, and congratulations to Emily Wasson, who won the iPod raffle drawing. Click here to bring Israel 360 to your campus in September! The Greater Sacramento Jewish community celebrated Israel's 59th Independence Day with a huge celebration at the California State Capitol. Of course, nobody could keep away from the Hasbara Fellowships table, which showcased the hit Flags for Humanity campaign - everyone loved it! On May 13th, the Stanford Israel Alliance, Stanford Hillel and Hasbara Fellowships hosted Harvard Law Professor and Israeli advocate- author Alan Dershowitz. With a packed house of 1,300 students, Dershowitz spoke about Israel's right to exist, the regional and international threats posed, and the dangers that pose a threat to us on university campuses across North America. Click here to bring a speaker to your campus! Professor Alan Dershowitz spoke at Northwestern University on May 9th to a packed audience totaling over 350! Students and community members were treated to an in-depth discussion concerning global affairs. Hasbara Fellows Gabi Lupatkin, Ariella Newberger, and Alison Schwartzbaum hosted Nissim Rueben, an Indian Jew of the American Jewish Congress. Mr. Rueben spoke to a diverse and captivated audience about the unique and deep relationship between Israel and India. Mr. Rueben touched on issues of commerce, technology and culture and also discussed the current status of the Jewish community in India. An event that brought together the pro-Israel and Indian community is the first in a series of cross-culture programs to be showcased by Hasbara Fellows at Brandeis in the semesters to come. Click here to receive more information on Hasbara Fellowships India-Israel initiative for the fall semester! The Partnership for Jewish Life and Learning selected the lecture given by Israeli Arab Journalist Khaled Abu Toameh at the George Washington University as one of the ten best events in the Washington DC area for the 2006-7 school year! Hasbara Fellows Harry Baumgarten and Sharona Getz put together the spectacular event and were presented with an award for their efforts. Over 120 students, community members and Hillel professionals were in attendance. The event was cosponsored by Hillel, the Student Alliance for Israel, the Jewish Student Association, the Israel Campus Coalition of Greater Washington, and Hasbara Fellowships. The event was an enormous success - Congratulations GW Fellows! Everyone knows about Wikipedia, a place to go to get the 'real' scoop. How often do you use Wikipedia to look up subjects you know little about? Now imagine how often other people use Wikipedia to look up subjects related to Israel. Wikipedia is not an objective resource but rather an online encyclopedia that any one can edit. The result is a website that is in large part is controlled by 'intellectuals' who seek re-write the history of the Arab-Israeli conflict. These authors have systematically yet subtly rewritten key passages of thousands of Wikipedia entries to portray Israel in a negative light. You have the opportunity to stop this dangerous trend! If you are interested in joining a team of Wikipedians to make sure Israel is presented fairly and accurately, please contact director@israelactivism.com for details! Britain has become in recent years the battlefield in Israel's fight for its existence as a Jewish state. The number of British organizations calling for the boycott of Israel, their public campaigns, and their constant comparisons between Israel and the apartheid regime of South Africa have made the battle for British public opinion particularly significant. In the face of boycott proposals by Britain's National Union of Journalists, by a group of British doctors and a group of architects, and in the wake of the Anglican Church's decision to divest from companies cooperating with Israel, even the Israeli left has no choice but to fight back. Taking off the gloves in this debate involves knowingly foregoing the kudos that British academia lavishes on all who are willing to express anti-Israel stands. The British University and College Union has even had the temerity to proclaim that Israeli lecturers who disown the policies of the Israeli government will not be boycotted. It is British academics who should lose sleep over this McCarthyistic demand. Academic freedom means first of all an open exchange of opinions, without coercion, and not shutting people's mouths. Click here to see our latest campaigns! See more information on our Israel Programs! Below is an excerpt from "Becoming Imperialist" by KEVIN PARSNEAU, ARJUN CHOWDHURY and MARK HOFFMAN in CounterPunch, May 24, 2007. If Donald Rumsfeld had listened to the generals and invaded with more troops, Iraq would be stable today. If the U.S. had provided security and basic services after the initial invasion, Iraqis would have embraced America's presence and agenda by now. If Paul Bremer had neither de-Ba'athified nor disbanded the Iraqi army after the invasion, the insurgency would have been manageable or non-existent. If you agree with any of these claims, you are an unwitting participant in American Imperialism. You criticize the "handling of the war" but you display faith in the capacity of the US to remake the world in its image through military force and administration. Such faith reinforces the logic of imperialist misadventures like Iraq, and paves the way for future ones. Senator Carl Levin (D--Michigan) expressed the "opposition's" view instructively: "America has given the Iraqi people the opportunity to build a new nation at the cost of nearly 3,000 American lives and over twenty thousand wounded. But the American people do not want our valiant troops to get caught in a crossfire between Iraqis if they insist on squandering that opportunity through civil war and sectarian strife"
John Orford has demonstrated that he knows something about lazy thinking in a blog post suitably entitled "Lazy Thinking" wherein he lazily critiques my blog post,"On 'Nostalgia for Babylon' "which, incidentally, makes absolutely no reference to anything Orford has written (unless he also writes for the BBC under the name of Lipika Pelham). However another blogger (DVP) having read her post, wrote up a rather biased, partly anti Jewish, partly anti-Israeli / anti-Zionist take on the modern history of Jewish peoples in the Middle East. In my opinion, it dehumanised Jews and demonised Zionists. As my original post linked to an article which evenly humanised both Jews and Arabs, I thought DVP's work was particularly twisted and conniving. Harsh and sweeping claims, but claims that Orford is too lazy to back up with either argument or facts. First of all, my post was not "a take on the modern history of Jewish peoples in the Middle East." It was a take on the specific question of Jewish relations in Iraq circa the time of the Nakba--the subject of the BBC article. Since my post portrays Zionism in negative light and since I am unapologetically anti-Zionist (all decent knowledgeable people are), I take no exception to the anti-Zionist characterization. However, I do take exception to the charges of anti-Jewish, anti-Israeli, dehumanizing, racist, twisted and conniving, etc. and if Orford has a shred of decency (a dubious proposition) then he will make his case or else apologize. Orford even lazily makes incorrect assumptions about my gender. Orford thinks the BBC article "evenly humanised both Jews and Arabs." Apparently, the complete absence of any Arab voices/perspectives in the article is no problem for Orford even though the event of the departure of Iraqi Jews from Iraq is highly charged and has been used to justify Palestinian dispossession and as an exemplar of rampant Arab "anti-Semitism." Finally, although you would not know it from reading Orford's post, nowhere do I claim or suggest that Arabs had "moral justification for treating Jewish people that lived in the wider Middle East so badly ..." In fact, the historical evidence suggests that Iraqis, generally, did NOT treat Jews badly at all, which is why Zionist agents decided it was necessary to bomb places in Iraq where Jews congregated, according to Giladi, Hirst, Shiblak, and Woolfson and which, according to Alexander, is also why Zionists--not Arabs--"willfully constructed the dichotomy of 'Arab' and 'Jew.' " I did write, "It is understandable that some Iraqis would be hostile to a community that had harbored agents of organizations directly involved in spilling Iraqi blood and ethnically cleansing Palestine." I stand by this statement, which says nothing pro or con about the morality of collective punishment or guilt-by-association--neither of which do I find to be morally justifiable. No Snow Here has a blog post entitled "Nostalgia for Babylon" where she discusses a recent BBC article, "Israelis from Iraq remember Babylon." She wonders "to what extent relationships between Middle Eastern Jews and non-Jews were good prior to 1948" and opines "There is the common fallacy that this is ancient fighting that has been going on forever (this fallacy also sets up an untrue division between 'Arab' and 'Jew') ... "
The BBC article has the foul smell of hasbara and suggests that for Jews life in Iraq was all sweetness and light--"It was an easy, happy life"--until those evil Arabs turned against the poor, innocent Jews in their midst. There is no mention, of course, in the BBC article that Zionists and, even the Mossad and Haganah, were active in Iraq's Jewish community long before the Nakba. This is documented in Zionism in an Arab Country: Jews in Iraq in the 1940s by Esther Meir-Glitzenstein and elsewhere. There is no mention either that thousands of Iraqi troops actually fought and died in Palestine trying to stop Jews from stealing the country when Jews, mostly recent European immigrants, were less than one-third of the population and owned ~7% of the land. It is understandable that some Iraqis would be hostile to a community that had harbored agents of organizations directly involved in spilling Iraqi blood and ethnically cleansing Palestine. ... March 19, 1950—a bomb went off at the American Cultural Center and Library in Baghdad, causing property damage and injuring a number of people. The center was a favorite meeting place for young Jews. ... David Ben Gurion, Israel’s first prime minister, told a Zionist Conference in 1937 that any proposed Jewish state would have to “transfer Arab populations out of the area, if possible of their own free will, if not by coercion.” After 750,000 Palestinians were uprooted and their lands confiscated in 1948-49, Ben Gurion had to look to the Islamic countries for Jews who could fill the resultant cheap labor market. “Emissaries” were smuggled into these countries to “convince” Jews to leave either by trickery or fear. Hirst, David. The Gun and the Olive Branch. (London: Futura Books, 1977). Shiblak, Abbas. The Lure of Zion: The Case of the Iraqi Jews. (London: Al Saqi, 1986). Woolfson, Marion. Prophets in Babylon: Jews in the Arab World. (London: Faber and Faber, 1980). The "Lavon Affair" of 1954 is a well-documented instance of Israeli agents attempting to covertly bomb American targets in an Arab country and placing the blame on Arabs. Jews and Christians, having lived for centuries as dhimmis were enthusiastic recipients of European educations and political ideas. Their language skills enabled them to reap employment opportunities when the British ruled Baghdad. Jewish global business networks developed in the framework of the British Empire to allow a visible minority of Jews to quickly become some of the wealthiest Baghdadis. As hatred towards the British colonial administration mounted, the Jewish reliance on British support became isolating and dangerous [This is echoes the main premise of Benjamin Ginsberg's The Fatal Embrace: Jews and the State--vfpd]. A small but visible Zionist movement developed in Baghdad during the 1920s under the leadership of ‘the teacher.’ From the outset, all major community figures and the vast majority of Jews distanced themselves from the Zionists, aware of the danger that it could pose to Jewish security [They probably would have been better off if they had organized publicly against Zionism but their opposition was based on expedience, not principle, as Alexander makes clear elsewhere--vfpd]. Arab nationalism viewed European colonialism and Zionism as its chief enemies during its formative years [With very good cause--vfpd]. And with major powers France and Britain tainted by their colonial exploits, many in Baghdad looked to Germany for guidance. A multi-dimensional relationship between Berlin and Baghdad served to militarize Arab nationalism and provide it with a totalitarian dress, while some of the virulent anti-Semitic rhetoric of Nazi Germany seems to have seeped into the hearts and minds of the Baghdadi masses through newspapers, radio, schools and the army. It is difficult to gauge from the sources consulted for this thesis what exactly the meaning of Nazism was to its Iraqi actors. Pro-German they were; pro-Nazi the Zionists have worked hard to make them out to be with relatively little recorded evidence of Nazi-like anti-Semitism. But Baghdadi Jews, who had never felt at home in Arab nationalist circles [Given the picture painted in the BBC article, why is that? Perhaps, contra Reuveni, some people were thinking "of who was Jewish and who was Arab"--vfpd], and who had distanced themselves from Zionism, did indeed become the victims of open hostility, culminating in the farhud of June 1941. While the farhud would not have occurred without the power vacuum in Baghdad with the fall of the Rashid ‘Ali coup, it nonetheless shocked the largely pro-integrationist Jewish community. The trauma was not to last for the vast majority of Jews, who capitalized on the wartime economy and preferred not to dwell on the horrors of the farhud. The Zionist underground was able to build up a sizeable movement through the 1940s, though the predominant theme in their correspondence with the yishuv was frustration at the lack of enthusiasm for their ideas amongst the local population. An even smaller number of Jews became active in the Iraqi Communist Party in search of an alternative response to the religious hostility in the country. Though all of these themes are important to understanding the Baghdadi Jewish experience between 1920-1948, I have used Zionism as the focal point of this thesis because Zionism was the root cause of the breakdown in Arab-Jewish relations in the modern period. Zionism was not the only factor. Colonialism, Nazi propaganda and the rise of an exclusive radical Arab nationalism all isolated the Jews for one reason or another. The Jewish community in Baghdad between the two World Wars experienced all of these major forces as they tried to educate themselves, succeed in their professions and stay out of trouble. It is probably for this reason that the vast majority of Baghdadi Jews were antipathetic to the Zionists. In an environment full of anti-Zionist rage on behalf of an emergent Arab nation, and in the context of anti-Jewish Nazi rhetoric and the unpopularity of their close economic ties with Britain, most Jews chose either to remain apolitical or to speak out actively against Zionism. However, the combination of Zionism and Nazi-tinged Arab nationalism prevented the Baghdadi Jews from living in genuine comfort. The force of the Zionist-Arab conflict grew to acquire regional centrality, and it was no great surprise that the Jews of Arab countries were amongst the ‘victims’ of this conflict, squeezed out of their native lands, only to be poorly treated by the nascent state of Israel. But Nazi-transmitted anti-Jewish propaganda in the newspapers and in the schools would never have made a significant impression on the Baghdadi masses without the ready-made hostility towards Jews that came from their religious association with Zionists. It was because of Zionism that Jewish-Muslim relations could never be like Christian-Muslim relations in Baghdad. Whereas many Christians experienced the same socio-economic benefits of British favoritism and even similar exclusion from nationalist circles, the Jews were guilty by association since their co-religionists were engaging in a daily campaign that was widely perceived to be anti-Arab and anti-Muslim in nature. And it was the Zionists who willfully constructed the dichotomy of ‘Arab’ and ‘Jew’, sowing the seeds of regional conflict that placed ‘Arab-Jews’ in no-man’s land. When the Arab nationalists reproduced this dichotomy and took the Zionists at their word, blurring the line between Jews and Zionists, the ‘Arab-Jews’, much to the joy of Zionist leaders, were forced into the arms, however reluctantly, of the Zionist state. ... The story of Baghdadi Jews is not, as the Zionist narrative would have it, just one of many examples of gentile hatred of Jews. And if the Zionists can be said to have ‘saved’ the Iraqi Jews, as contemporary Zionist historians would have it, then they only needed saving in the first place because of the growth of Zionism and the stirring it aroused around the Arab world. Although Zionism was the solution to a problem for European Jews, it was the creation of a problem for the Arab world. 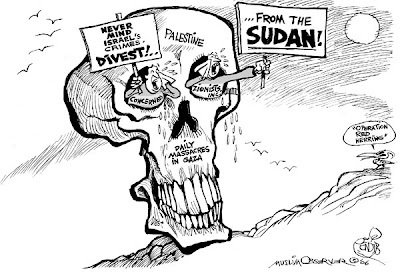 I have previously posted two (see links at bottom) of Khalil Bendib's excellent editorial cartoons on Darfur. Below, for your edification, are three more. Regarding the first cartoon, I've often marvelled at how some people who know that Colin Powell et al. spread falsehoods in the run up to the 2003 US invasion of Iraq seem to be taken in so easily by these liars when it comes to Darfur. The second cartoon, I think, speaks to the false dichotomy of black/African vs. Arab that is frequently propagated in Western discourse. For example, in an April 27, 2007, NPR report Gwen Thompkins distinguishes between "black rebel forces" and "government-sponsored Arab militias." The accompanying text on the National Public Radio web site speaks of "Tension between the region's African farmers and Arab pastoralists" and says "People in Darfur refer to themselves as 'black,' and many Darfuris say that the dispute with the Arab-dominated government in Khartoum is ethnically based." An NPR report the day before ("U.N. Aid Chief Tours Darfur's Refugee Camps") was just as bad describing the fighting as between "African rebels and Arab militias." Although the conflict has also been framed as a battle between Arabs and black Africans, everyone in Darfur appears dark-skinned, at least by the usual American standards. The true division in Darfur is between ethnic groups, split between herders and farmers. Each tribe gives itself the label of "African" or "Arab" based on what language its members speak and whether they work the soil or herd livestock. Also, if they attain a certain level of wealth, they call themselves Arab. Sudan melds African and Arab identities. As Arabs began to dominate the government in the past century and gave jobs to members of Arab tribes, being Arab became a political advantage; some tribes adopted that label regardless of their ethnic affiliation. More recently, rebels have described themselves as Africans fighting an Arab government. Ethnic slurs used by both sides in recent atrocities have riven communities that once lived together and intermarried. "Black Americans who come to Darfur always say, 'So where are the Arabs? Why do all these people look black?' " said Mahjoub Mohamed Saleh, editor of Sudan's independent Al-Ayam newspaper. "The bottom line is that tribes have intermarried forever in Darfur. Men even have one so-called Arab wife and one so-called African. Tribes started labeling themselves this way several decades ago for political reasons. Who knows what the real bloodlines are in Darfur?" 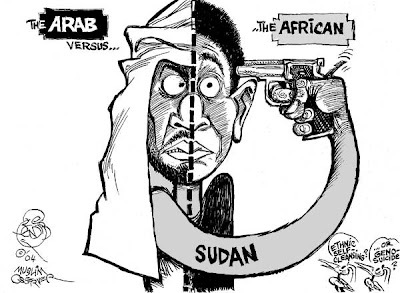 Characterising the Darfur war as 'Arabs' versus 'Africans' obscures the reality. Darfur's Arabs are black, indigenous, African and Muslim - just like Darfur's non-Arabs, who hail from the Fur, Masalit, Zaghawa and a dozen smaller tribes. Until recently, Darfurians used the term 'Arab' in its ancient sense of 'bedouin'. These Arabic-speaking nomads are distinct from the inheritors of the Arab culture of the Nile and the Fertile Crescent. 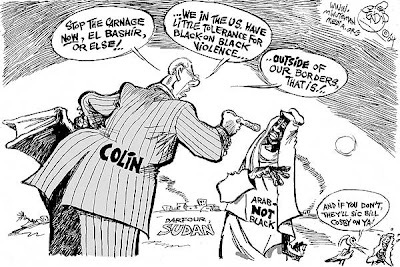 'Arabism' in Darfur is a political ideology, recently imported, after Colonel Gadaffi nurtured dreams of an 'Arab belt' across Africa, and recruited Chadian Arabs, Darfurians and west African Tuaregs to spearhead his invasion of Chad in the 1980s. He failed, but the legacy of arms, militia organisation and Arab supremacist ideology lives on. Many Janjaweed hail from the Chadian Arab groups mobilised during those days. Most of Darfur's Arabs remain uninvolved in the conflict, but racist ideology appeals to many poor and frustrated young men. Since 1987 there have been recurrent clashes between the Arab militias and village self-defence groups. Their roots were local conflicts over land and water, especially in the wake of droughts, made worse by the absence of an effective police force in the region for 20 years. The last intertribal conference met in 1989, but its recommendations were never implemented. Year by year, law and order has broken down, and the government has done nothing but play a game of divide-and-rule, usually favouring the better-armed Arabs. In response, the non-Arab groups (some of them bedouins too - there's a clan related to the Zaghawa that even has the name Bedeyaat) have mobilised, adopting the label 'African', which helps to gain solidarity with the southern-based Sudan People's Liberation Army, and is a ticket to sympathy in the West. So, whose interest is served by falsely promoting the image of the Darfur conflict as one of Arabs committing "genocide" (a term the United Nations and Doctors without Borders say does not apply) against black Africans? Undoubtedly, part of the problem is the media's desire to simplify complex issues but the "war on Islam" and Arabophobia cannot be ruled out as key factors.